Visitors to LEGOLAND Florida can now immerse themselves in the creative world of LEGOS at the adjacent LEGOLAND Hotel, located just steps from the main entrance to the theme park. The five-story, 152-room hotel is situated on historic Lake Eloise with some rooms enjoying lake or theme park views. The colorful and highly themed hotel is sure to bring children’s imaginations to life from the time they are greeted by a LEGO dragon at the spectacular entrance that leads to themed play areas, a family pool that overlooks Lake Eloise, lounge, family restaurant, LEGO models and interactive features throughout. As parents check in at the reception desk in the lobby, children are sure to notice the entire wall of more than 5,000 LEGO mini figures. And, on their way to their themed room, everyone will be amazed at the disco elevator that features pulsating lights, music “lava” tiles, rotating mirror ball and sound effects that announce the arrival on each floor. The Castle Play area, based on the LEGO Kingdom and Pirates lines, features a pirate ship and an interactive castle surrounded by a LEGO-filled moat. Young guests can pull on a handle to enter the castle and walk the interactive LEGO ogre. The LEGO Club Room offers a Character Meet & Greet, building areas, LEGO Club magazines and videos. Parents and kids can choose from four different themed rooms – Pirate, Adventure, Kingdom or Friends – and between either “themed” or “premium themed.” Premium themed rooms include additional LEGO models and themed wall décor; and, of course, are more expensive. In fact, they start at $895.00 per night through $2895.00, based on the number of guests. Considering there are at least eight LEGO models in every themed room, children shouldn’t be disappointed if you don’t spend the extra money. Every room includes a treasure chest that young guests can unlock once they complete a special treasure hunt activity. All children’s sleeping areas include a bunk with a trundle bed. Keeping the kid-friendly focus, additional features include peep holes at a lower level and LEGO bricks in each room for children to create their own masterpieces. Adults will be happy to know that room service is available and each room includes free Wi-Fi. Additionally, all rooms include a king bed in the adult sleeping area, two high-definition flat panel televisions, mini-fridge and coffee maker. Bricks Family Restaurant features a buffet station designed specifically at a height kids can reach and includes healthy food options. Skyline Lounge features humorous scenes within a LEGO skyline that was designed by LEGOLAND’s master builders. A stay at LEGOLAND Hotel is a bit pricey; but, of course, you're paying for convenience to the theme park with special early morning access and the entire experience of staying and playing amid LEGO-themed settings. Rates begin at about $379 per night, plus the additional $20 per night resort fee and the 12% applicable tax can translate into nearly $450.00 per night total. The resort fee pays for self parking, Wi-Fi access, local calls, pool towels and nightly children's entertainment. Valet parking is available for an additional $20 per night. 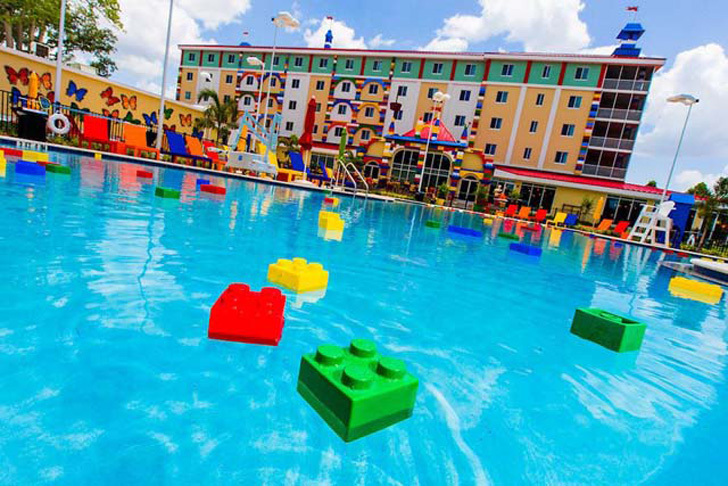 LEGOLAND Hotel is located at One Legoland Way, Winter Haven, FL 33884. For additional information call 877-350-5346. Reservations are available at www.LEGOLANDHotel.com or by calling 1-877-LEGOLAND (534-6526). When booking, ask about special packages that include theme park admission along with your stay. Annual pass holders receive a 10% discount on hotel stays.